Good afternoon everyone! I hope you’re all still basking in the wonderful sunshine…what a gift! 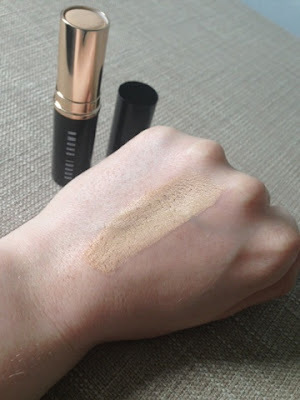 Today I wanted to mention a new makeup product I picked up recently. It has been highly reviewed and recommended by many of the youtube beauty channels and so many of the blogs I love reading. 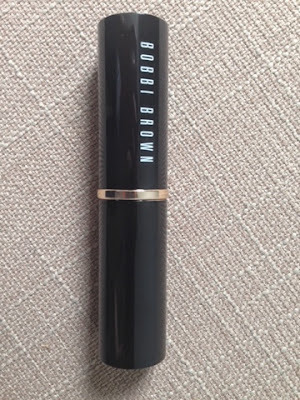 It’s Bobbi Browns foundation stick and I got this in the shade ‘sand’ no. 2. Now, as I’ve said before, my go-to foundation for a long time has been Estee Lauder’s Doublewear. (which I still love!) But because my bottle is beginning to run out and I haven’t replaced it yet, I was sorely open to temptation when I wandered past the Bobbi Brown counter the other day! I’ve never actually used a foundation stick before, for some reason I always likened it to using tonnes of concealer on your face, haha, but anyway I fell head over heels for the consistency of this little beauty. I’ve read in a few blogs that they changed their formula in their foundation sticks, now I don’t know what they were like before, but the one I have now is absolutely brilliant! It has a lovely creamy soft finish that blends effortlessly into my skin. It applies well using makeup brushes or just being blended by fingers and it creates a flawless but light finish which has, in my opinion, a great coverage without feeling heavy or cakey. It truly feels like one of those ‘your skin but better’ moments when I wear this foundation, which is nice because at the end of the day makeup should look natural and only enhance your natural skin. I actually think this kind of applicator is a very practical way to apply foundation, it’s certainly less messy than using a liquid which is great especially for ‘on the go’ ladies. 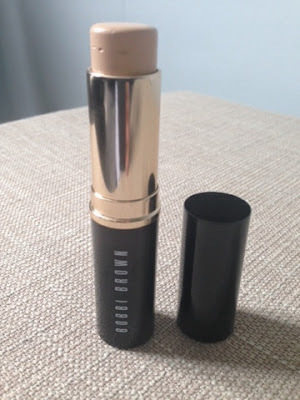 I like how slim and neatly this fits into my daytime makeup bag too, which makes it really handy for touch ups during the day, not that I need many with this particular stick! The staying power is very impressive and I actually find that once I apply this in the morning, it sits in place till evening, come rain or shine! What’s not to love about that, right? I didn’t imagine I would be saying this so soon, but I really do rate this foundation up there with EL’S Doublewear. It offers a nice alternative which definitely is easier to apply, especially if you’re a little pushed for time! In terms of its formula and lasting power, I must say I’m impressed so far, this works well with my usual makeup routine and makes a great base for blush and highlighter too. It’s not the cheapest foundation i’ll admit, but I always think if you’re going to splash out on on item of makeup, make it your foundation ladies! A great base will work wonders for the rest of your makeup!